Spiced Persimmon Chutney: Take two firm persimmons and set them aside. Peel and slice remaining persimmons and put them into a large saucepan. Using a potato masher, mash the fruit until it is broken down and resembles a chunky jam. Turn your burner on to low heat and bring the persimmons to a boil. Let them simmer for about 20 minutes. Stir often so the fruit does not burn. After the persimmons have cooked for about 20 minutes, add the spices and the vinegar mixture and mix well. Keep the heat low, bring the mixture up to a boil again and let it simmer on low heat for about 1 hour, stirring often to avoid burning. After the chutney is cooked and reduced (about 1 hour) peel and chop the remaining two persimmons and add them to the saucepan. Cook for another 10 minutes and then put the chutney into a bowl and let it cool to room temperature. Pork Tenderloin: Preheat your oven to 450°F. Truss the pork tenderloin so that it is of equal thickness throughout. Place the pork onto a baking sheet lined with parchment paper and cover in a good amount of salt (about 1 Tbsp) and a sprinkling of ground pepper (1/4 Tbsp). Put the pork tenderloin into the oven and roast for 10 minutes. This will give the roast a good skin to help keep the juices in during the remainder of the cooking process. Turn the temperature down to 350°F and cook for another 15 minutes, or until the internal temperature registers at 71°C (160°F) in the thickest part of the meat (about 20 to 25 minutes in total). Remove the pan with the tenderloin from the oven and using tongs, quickly but carefully place the tenderloin onto a cooling rack to rest for 10 minutes. After the roast has rested, slice the pork into 1.5 inch thick medallions using a sharp knife. Serve immediately and with the persimmon chutney layered on top. 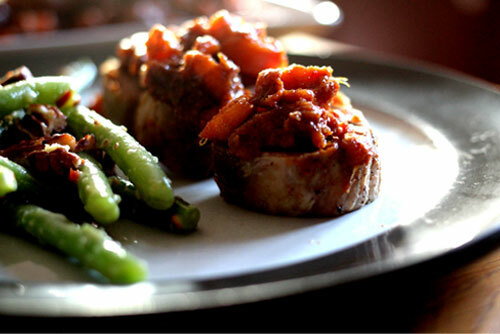 Save any leftover pork and chutney in an airtight container in the refrigerator for up to 2 days.